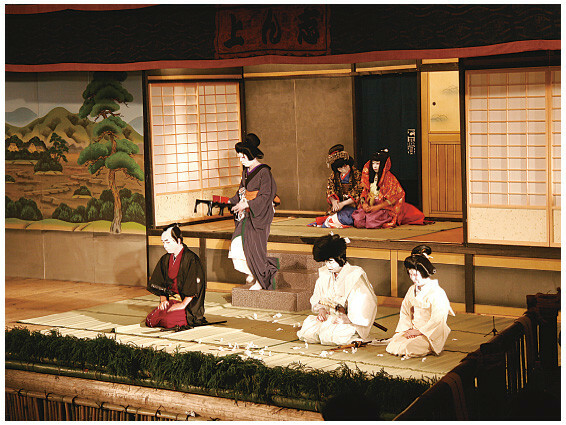 The Nishi-Shioko Revolving Stage is an assembled stage of which only the stage floor materials of the stage, including the hanamichi (a walkway leading out into the audience), the revolving stage, and the stage equipment are stored, while the timbers and bamboo poles used in the pillars and roof of the stage are cut and used according to necessity and then sold off after the performances have been completed. 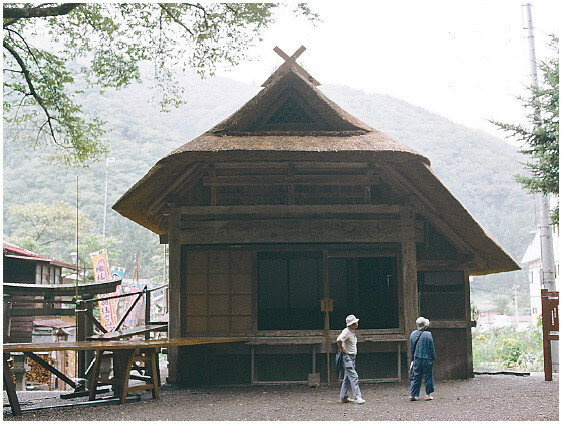 Making use of these characteristics, the revolving stage was also very frequently lent out to other villages. 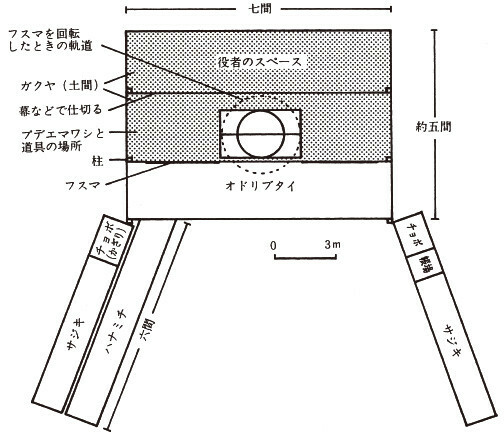 It is possible to assemble the stage according to the plot of land to be used in stage front widths of from four ken to a maximum of seven ken (one ken is roughly 1.8 m), and the length of the hanamichi can be assembled either as four ken or six ken. Located behind and at the centre of the roughly three metre deep stage, and raised slightly above it, is the two ken wide and roughly 2.4 metre deep revolving stage that is the origin of the name of this type of stage. To make the skeleton framework for the roof, bamboo poles of five to seven ken in length are interwoven into a grid and bound with rope. This framework is then covered with reed matting. The roof over the fan-shaped audience area uses the flexibility of the bamboo, fixed so that it rises up, to form a natural arch. 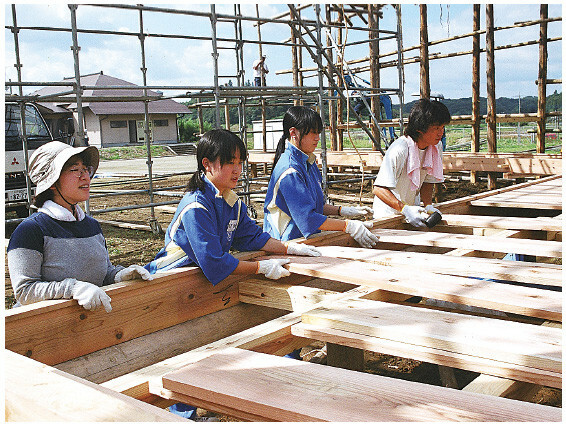 The local people call the curve of the leading edge of the roof kagami, and used to evaluate the construction of the stage on any particular year by the beauty of this curve. The term “assembled stage” has a strong sense of “makeshift,” and these stages are often thought of as being of a smaller scale and flimsy when compared with permanent stages. 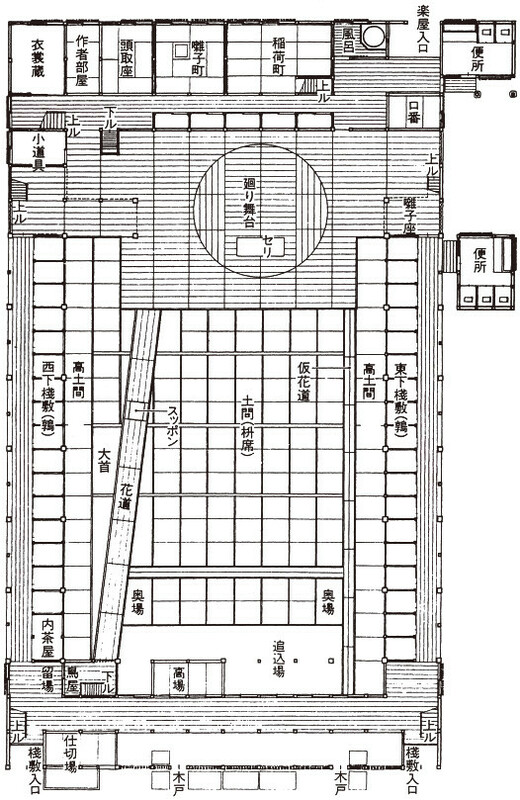 However, permanent stages built in the grounds of shrines were surprisingly small, in general measuring four ken to five ken in width, smaller than the Nishi-Shioko stage, which has a maximum stage front of seven ken and a hanamichi of six ken. The Ichimura-za theatre in Edo (now Tokyo), which existed in the Bunka and Bunsei years (1804 to 1830) is reported to have had a stage width of 6.5 ken, and although the assembled stage did not have a seri or suppon (trap-lift doors from which actors could appear, the seri being larger than the suppon) it can certainly said to have been a splendid construction of ample width. 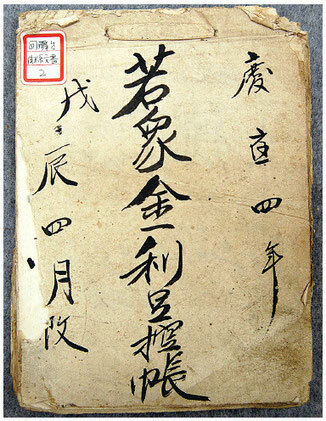 In olden times, taking about a month after the completion of the rice harvest in late autumn, timber and bamboo would be cut and a field borrowed for the assembly of the stage before the winter wheat was sown. When the performances were over, the stage was dismantled, the parts not stored sold off at auction, and then the field tilled by all the villagers before being returned to the landowner. 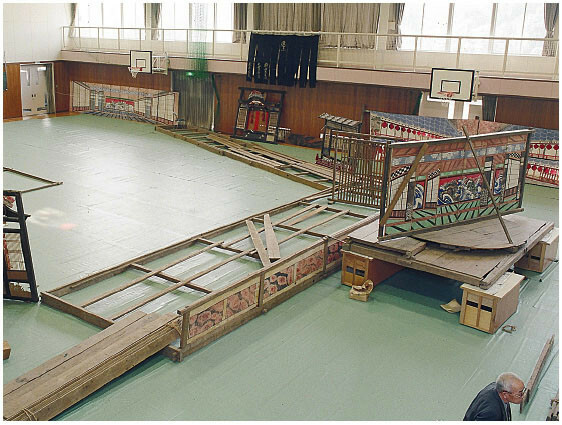 At present, the timber used for the pillars, floor supports and so on are all stored, and the bamboo for the roof is cut each time the stage is set up in the grounds of the local community centre, located in adjacent Kita-Shioko, with a stage width and hanamichi length of six ken each. When the stage is completely assembled, including the sajiki (theatre boxes) and the actors’ dressing room, the width and depth of the complete structure are about 20 m, and the height of the roof is about seven metres at its highest point. What the stage looked like when it was first being constructed and when all the parts of the stage floor that were stored in the warehouse were produced is not known. 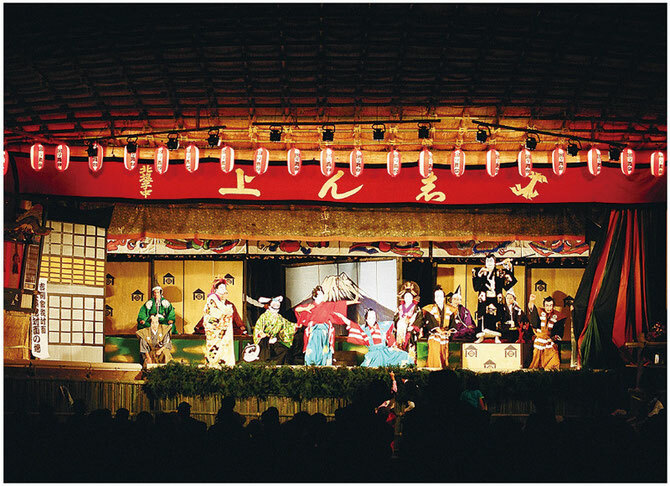 A village elder who was born in 1894 has said, “Since the actors did not like to get their costumes torn, it appears they made the present stage out of planed wood,” and says that as far as he can recall, the stage had the same revolving stage and hanamichi that it has at present. However, according to the elder’s memory, the revolving stage was rotated by pushing on iron bars below stage, but changes have been made to the stage in different times, and at some point the rotation method was improved to a mechanism where the stage is rotated from the same level as the stage rather than from below stage (the revolving stage panel has castors fixed to its underside and rolls around on top of another panel of the same size). When the study of the stage was carried out in 1991, the revolving floor was rotated by pulling ropes tied onto iron handles fixed to the upper part of the revolving stage. Since the stage was revived in 1997, after an interval of half a century, some of the older parts and stage equipment have been conserved as cultural properties and their replacement with equipment and parts that match the modern Japanese stature has been progressively carried out. 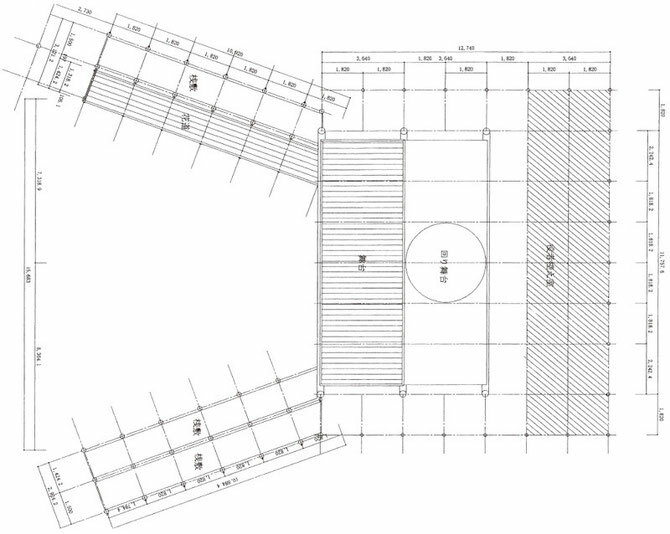 Plan of the Nishi-Shioko Revolving Stage when assembled with a stage width of seven ken. It is similar in size to the Ichimura-za stage, shown here on the same scale. 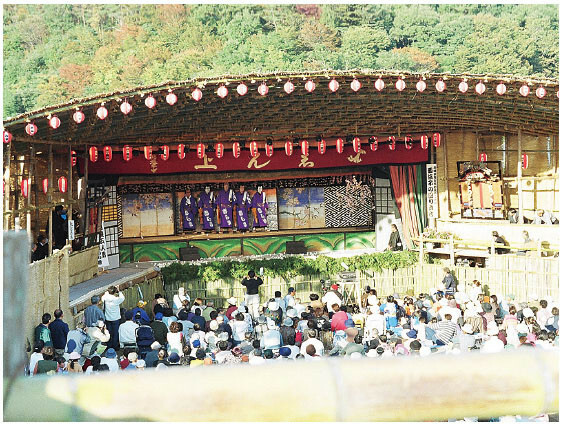 The Hinoemata Stage in Hinoemata Village, Fukushima Prefecture, which stands permanently in the grounds of the Koma-ga-dake Shrine. The stage front width is about three ken. The plan and elevation of the stage assembled in 2003. The old timbers have been conserved and the main stage has been adjusted to a depth of two ken, the diameter of the revolving stage adjusted to two ken, and the wings of the revolving stage have been fitted with floor boards. The floor of the stage wings and other parts have been adjusted as necessary. Drawing by Mr Noriaki Nabatame. The parts of the revolving stage floor that were stored in the warehouse. At the time of the study, since one section of the stage material was missing, it was set up with a width of six ken, not seven ken. The wing sections were also missing. What kind of place is Nishi-Shioko? See Nishi-Shioko Revolving Stage performances on Youtube!